The heal spell is finally released for Clash Royale, but you can only unlock the newest Clash Royale card through the heal spell draft challenge. This is an overview of the new heal spell and the heal spell draft challenge! 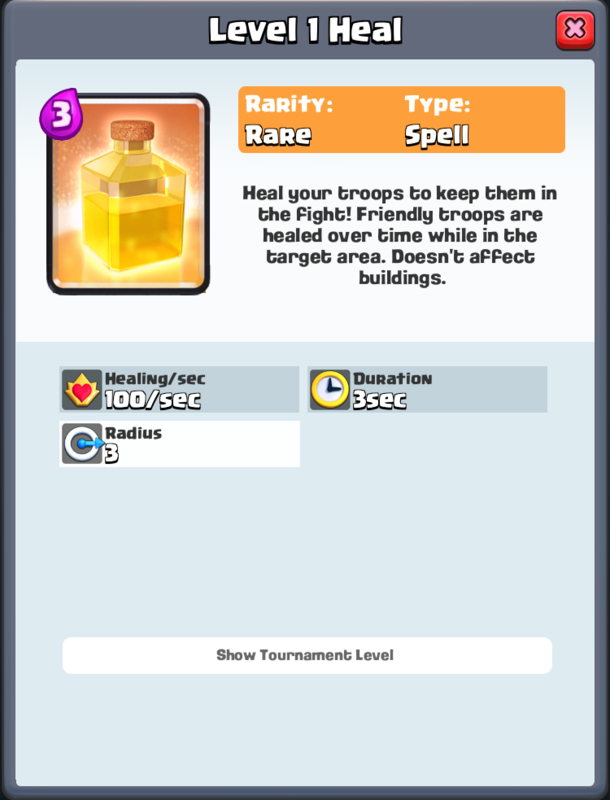 The heal spell is the newest card introduced in Clash Royale, from the March 2017 update. This update also featured the bandit, along with night witch and bats which are still to come. It’s duration and radius will always stay the same no matter how much you upgrade it. The only thing that changes is the heal per second, which increases to 176 at tournament standard. Here’s how the heal spell stacks up against other spells. 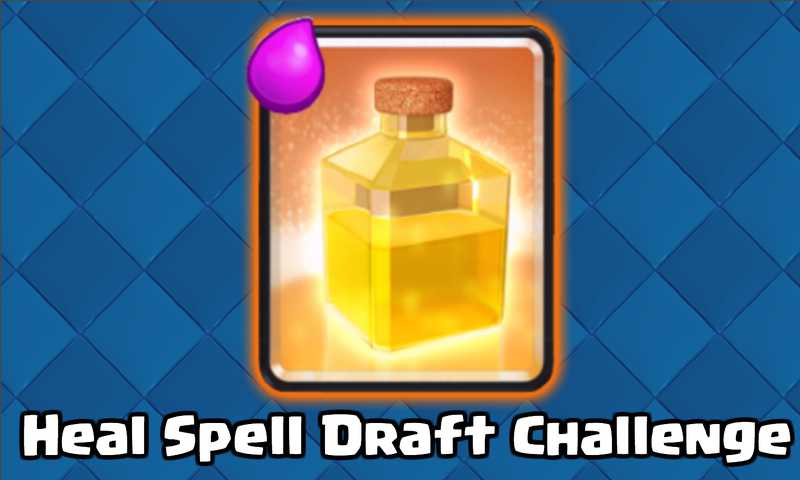 While the heal spell will be in game, the only way to win heal spells will be in the heal spell draft challenge! 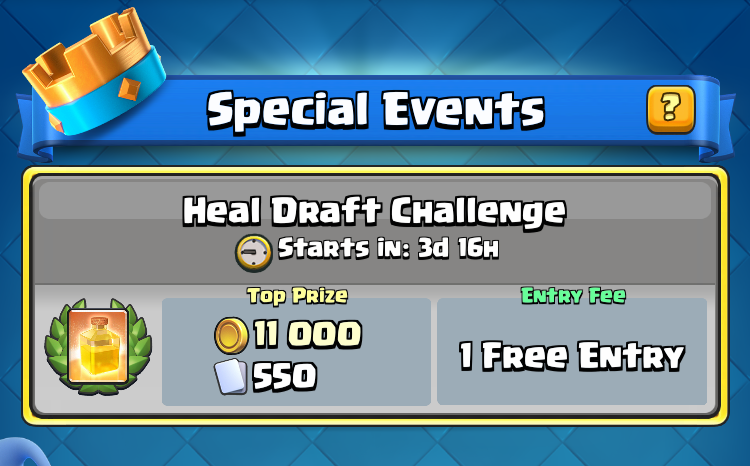 This draft challenge will be almost exactly like the the bandit draft challenge. 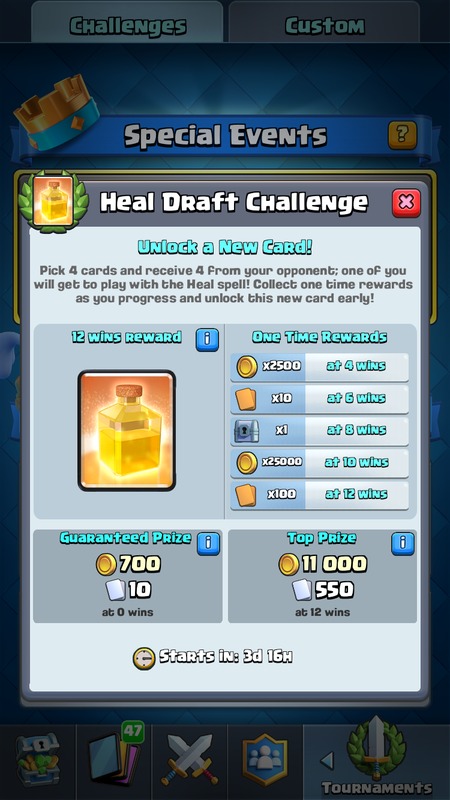 It will be a normal draft challenge, but every battle, one player will get the option to draft the heal spell. The rewards will be half of a normal grand challenge, but as with most special events, there will be extra rewards for hitting win milestones! So here are all the extra rewards for hitting specific win amounts. Remember, you will still get a chest after you win 12 or lose 3. If you get 12 wins, you will have enough to upgrade your heal spell to tournament standard! Hitting 6 wins will give you enough heal spells to upgrade to 4. That’s going to do it for the heal spell draft challenge and overview of the heal spell! Thanks for reading and comment down below what you think of the new heal spell card! What happens if you get the card in a draft challenge but you are not in that arena.Do you still get it or wait till you get into that arena. You can use any card in draft challenges! lol – these will be broken after heal: HEAL! Big guys (not exactly tanks) like knight, miner etc. I think arrows will see a rise, since zap doesn’t take out minions all the way, giving them the ability to be healed. Pingback: Clash Royale Heal Spell Draft Challenge | Clash of Clans Guide, Strategies, Tricks and More! as heal was an anti-poison spell, heal will be poison’s worst victim, will poison still be good? Or get totally knocked out by heal? Still good, because heal will last 5 seconds shorter than poison! Like the worst card to deal with for heal spell. However, it seems like users below 3000 trophies can get the Heal. 6 wins isn’t so hard to get to if you’re in Jungle Arena or even Frozen Peak, and Heal then can be donated/requested afterwards. I have a feeling that the overall gameplay in Clash Royale will change drastically from the heal spell’s release. Good luck to all you clashers out there, especially in hog mountain and higher! Maybe radius nerf, duration buff, and heal Rate nerf as well. That’s so true! Miner cycle decks will be so op now, and even graveyards, with certain level differences, will be amazing against skarmies defending. Also, for example, a level 4 skeleton army vs. a level 5 one would result in, if the level 5 one had heal, no deaths (because they would heal back the sliver of health before the next attack).